This page describes the method to use opencv2.framework(OpenCV 2.4.6.1) on Mac OS X. Similar patch has been posted in the past(Patch adding Mac OS X Framework capabilities (Patch #2037)). I modified the patch for OpenCV 2.4.6.1. In addition, I have customized the configuration of the part. The difference between posted patch and my customized patch is as follows. I have enabled the frequently used configurations personally. I have disabled "BUILD_xxxx_TESTS". Because these configurations are unnecessary for implementation. This page's framework supports only x86_64. Because some 3rdparty libraries don't support i386 architecture. Please apply the patch to OpenCV 2.4.6.1. Please add the execute permission to build script(build-osx-framework.sh). Please run build script(build-osx-framework.sh). Argument of this script is the target OpenCV directory. "opencv2.framework"(Release/Debug) will be generated in the following locations. I will explain how to use opencv2.framework in Xcode with figure. Please open the project in Xcode, and then go to the "Build Phases" window. 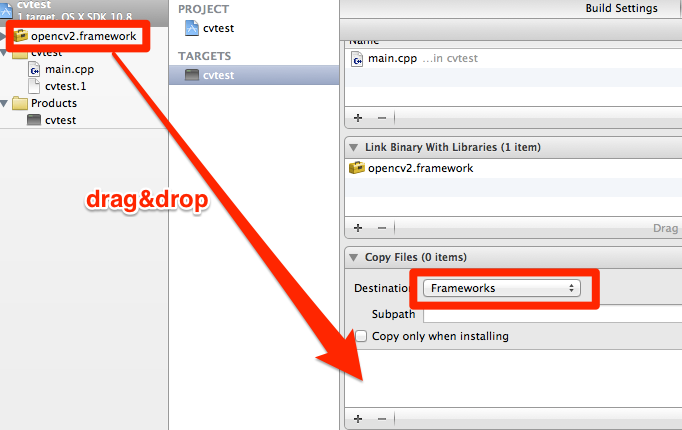 In "Link Binary With Libraries", please push "+" button and add generated opencv2.framework. After this operation, "opencv2.framework" is added as use framework. Please specify the "Add Copy Files" in order to copy framework into your project. Please specify the "Frameworks" as a setting of "Destination" and move(drag&drop) "opencv2.framework" from the Xcode navigator left screen. 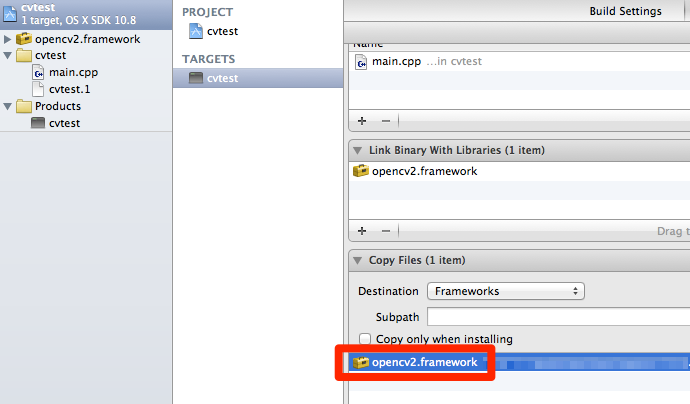 After this operation, "opencv2.framework" is added as copy framework. Please enjoy your implementation using OpenCV!